Media and Contents: Soft cover, landscape format, 50 pages plus covers (incl. 2 pages and front and back in full color). Advantages: A broad overview of the Tupolev SB giving a good introduction to this bomber. It is not often that spending less money can still bring you great value, but this “in action” seems to prove other wise. A while back I did a review of a book on the Tupolev SB Bomber from Icarus Aviation Press. The Icarus publication is perhaps the finest book on the subject, and a benchmark for aircraft books in general. But not everyone has an interest in the Tupolev bomber that would require the purchase such a book. Where does that leave those who are still interested, but less so, in this aircraft and its use by various air forces during WW-2? Well, I’m glad to say that this “in action” volume will provide excellent information. While it looks like the typical “in action”, the organization is quite interesting. 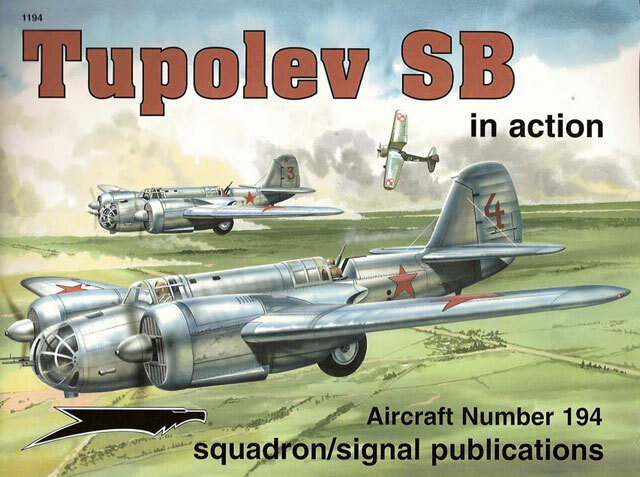 The author covers the development of the Tupolev SB in a very concise and detailed manner. However, rather than making the Tupolev’s operational use a separate section, the author integrates operational use in with the development of the various sub-types. Of course, pictures are an important component of any “in action” book, and this one is no exception. There are excellent picture of the Tupolev SB in its major variants and with various air forces. There are also a few pictures of the interior, armament and, of special interest, the bomb bay and bomb cells. There are also 13, nicely done, color profiles and artwork of the Tupolev SB bomber. But, due to publication requirements, not all air forces using the Tupolev are fully represented. Color profiles, being interpretations of black and white images and other information, are not without a bit of controversy. For those who love color debates, it is interesting to note that the “in action” shows the colors of the Czech camouflage (also used on some Luftwaffe and Slovak aircraft) as brown with two greens. The profiles in the Icarus publication show the camouflage as brown with green and a color that resembles RLM 02. Now you are saying to yourself: “Why is he worrying about colors, when there is not even a good model (let alone any model) of this aircraft?” You would be correct. 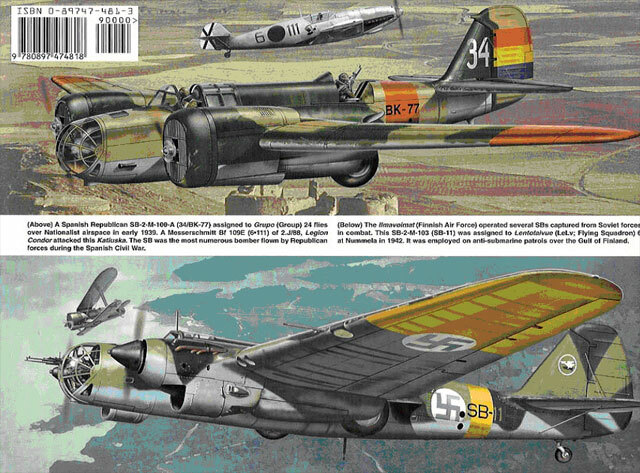 We now have two excellent books, at different levels of detail, on this bomber. So why don’t we have a mainstream model? Anyone who picks up this Squadron/Signal “in action” will see that it is not only a fine inspiration for modeling this historically important aircraft, but also an excellent introduction to and overview of the Tupolev SB bomber. I highly recommend it to any one who has an interest in an aircraft that saw action from Spain all the way to China. Hopefully, interest in this book will induce a company to issue a model.